Rynfield is a suburb of Johannesburg and located close to OR Tambo International Airport. Johannesburg is the largest city in South Africa and the hub through which most tourists come and go. Safari Manor is our cosy and homely bed and breakfast guesthouse in Rynfield, Johannesburg. The property offers comfortable and secure overnight accommodation for travellers and tourists. We have all the normal facilities you would expect from a guest house located in a major city. Safari Manor is often used by guests who need overnight accommodation before or after a safari. We cater for all travellers including couples, singles, groups of friends and small families. We regularly receive international guests from various nationalities. You will feel welcome and at home in our safe and cosy guesthouse. We look forward to welcoming you. We do airport transfers and can arrange transport taxi to and from attractions close by. We are close to OR Tambo as well as the Gautrain station. Accommodation is on a bed & breakfast basis. Other meals such as snacks or dinners can be ordered from our restaurant. Drinks can be ordered from our bar. We have a nice outdoor pool which is great for cooling down during our hot summer days. You can also relax on our main patio overlooking the pool while enjoying the outdoors. We offer free internet access. Wi-Fi is available in all areas at Safari Manor. There are several attractions within easy driving distance and these include a golf course, water park, bunny park, medical center, entertainment complexes and casinos. 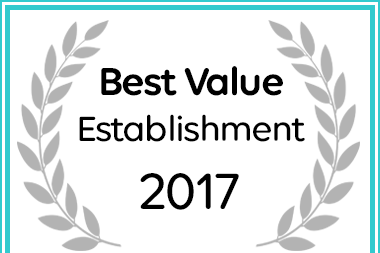 Afristay has named Safari Manor in Benoni a Best Value Establishment. Safari Manor - Cozy Johannesburg Guest House. All Rights Reserved.